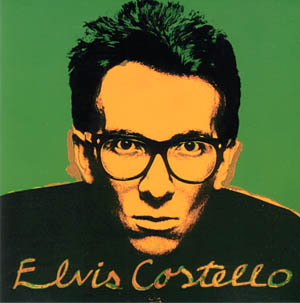 As an addendum to our Elvis Costello posts below and above, here are three different interviews with the man, one from a promo disc, one from a bonus disc, and one from a CD single. The gem of the bunch is probably An Overview Disc, which was included with initial runs of the 1995 Rykodisc reissue of Blood & Chocolate. Since that album rounded out the series of reissues, the disc was a nice, yes, overview of his career up to that point. This epic session lasts almost the full length of a cd, some 78 minutes long! The next interview is actually from a year earlier, but serves as a nice follow-up to the above disc, as it concerns Brutal Youth, the album that reunited EC with his Attractions and old friend Nick Lowe, and harked back to that earlier period. It's from the Warner Brothers promo cd Elvis Costello: Words and Music (a series of promo interviews with WB artists on occasion of an album release; I'll post one with Paul Simon soon). The talk is interspersed with song clips. The interviewer this time is Bill Flanagan of Musician magazine(later to head VH1, and author of one of the best ever books of interviews with songwriters, Written in my Soul. If you can track down a copy, do. He's got a cool new novel out about rock 'n' roll history, too, by the way.) It's split into two segments of about 24 and 22 minutes. Lastly, an interview from a year earlier still comes from the "Collector's Edition" UK cd single for the Juliet Letters track "Jacksons, Monk and Rowe". The 14 minute segment is drawn from the Juliet Letters video, and is also mixed with album samples. This is probably the least desirable of the bunch, especially if you have the video or DVD. I know these will be of limited interest, but I hope those who are interested will enjoy. Thanks for the interviews. Haven't heard them before, so should be very interesting. P.S. BTW, As soon as I get a chance, I will put a link to your blog from mine, and make a note of the Costello stuff you have here. Thanks again. Possible to re-upload to a new site? Cheers!